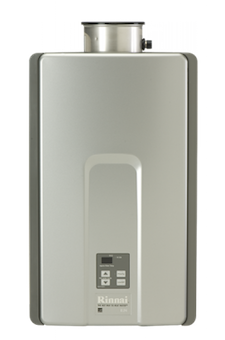 Rinnai Tankless. Energy Factor of .82 for Natural Gas and Propane. Built-in Rinnai Circ-LogicTM recirculation program cycles an external pump at pre-set intervals and temperatures to maximize efficiency and comfort (see brochure for more details). Certified for Installation in Manufactured (Mobile) Homes. Enhanced scale detection lessens possibility of serious, long-term damage to unit. Temperature lock function prevents accidental or unauthorized changes to water temperature.